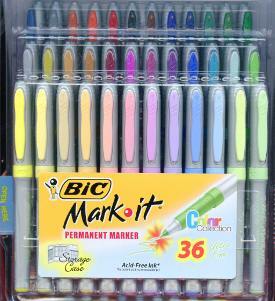 I have used the Bic Mark It™ Ultra Fine Black Permanent marker since day one of my crafting life. To see this amazing set of 36 trendy colors was a complete joy, I love fine detail work on my collage, altered art, domino jewelry, and paper art projects. With this great set of colors I added more colorful detail with confidence and flair. The nib stands up to use and a little abuse, as permanent markers are a tool used frequently by crafters. The packaging acts as a carrying case for the markers, a nice plus. The color is long lasting, acid-free, and you can mark on just about any surface from glass, metal, plastic, photo paper, foils, coated, and even oily surfaces. Colors include Petal Pink, Peach Parfait, Summer Melon, Lemon Bliss, Stone Grey, Playful Purple, Hot Aqua, Deep Sea Blue, Woodsy Brown, and For-Ever Green. The manufacturer does not recommend these markers for fabric, but I am guilty of doing just that with good results. There is no need to shake this ink pen and you should protect your worktable or surface. Great variety of color and great idea to make the packaging a storage system too. Excellent and affordable permanent ultra fine tip marker. (And to those who doodle or Zentangle, this is a perfect pen set to create colorful design). I'm just learning Zentangle and could really use this set. It looks like wonderful colors. I absolutely love Bic Mark It's! I have always wanted the larger assortment, because there are so many things you can use these on! It's the go to marker!!! I've always wanted to use these, especially when I'm working on a special scrapbook for one of my daughters and their children. Right now I'm putting one together for my youngest adopted daughter and my youngest grandson. Ultra fine in so many colors! Just what I have been looking for and need! An excellent tool for so many crafts. Wonderful colors and so many uses, it's a must have! Does this work well on gourds? They are like wood.